An audience member shows Ferguson Mayor James Knowles III a rubber bullet wound that he says he received during unrest in the north St. Louis County city. A forum sponsored by St. Louis Public Radio became heated, with ire being directed at Knowles. A forum Thursday evening peering into Ferguson’s longstanding tensions as well as the St. Louis region’s racial divisions became angry and heated, with most of a crowd’s ire directed at the town’s mayor. Audience members expressed searing criticism of Ferguson’s governance and leadership, both of which have come under fire since one of the Ferguson's police officers shot and killed 18-year-old Michael Brown. 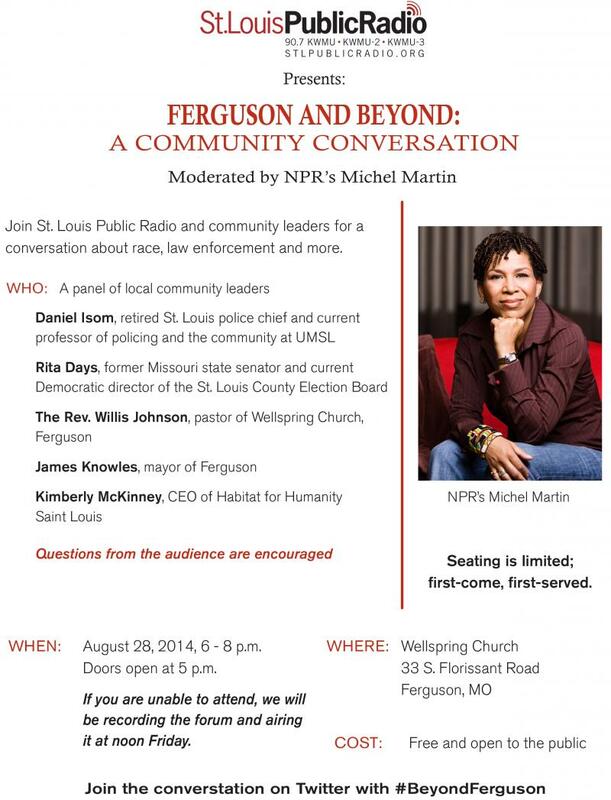 NPR's Michel Martin moderates "Ferguson and Beyond: A Community Conversation" on August 28 at Wellspring Church in Ferguson. The forum was held at Wellspring Church in Ferguson and drew a standing room-only crowd of more than 200. It was sponsored by St. Louis Public Radio and moderated by NPR’s Michel Martin. Panelists included Ferguson Mayor James Knowles III, former St. Louis Police Chief Dan Isom, former state Sen. Rita Days, D-Bel Nor, Habitat for Humanity St. Louis CEO Kimberly McKinney and Wellspring Church Pastor Willis Johnson. The forum drew a capacity crowd. Many people in the sweltering church were fiercely upset with how Ferguson officials handled the shooting death of Brown. Some expressed anger about the incident itself. Others questioned the city’s policies on ticketing people. And many were upset that Brown’s body was in the street for several hours. In response, Knowles said the body stayed on the street in order to not interfere with the St. Louis County Police Department’s investigation of a potential crime. Isom – who was recently tapped by Gov. Jay Nixon to be the state’s director of public safety – took issue with Knowles’ explanation. Knowles was constantly put on the defensive. At one point one of the audience members came forward to show rubber bullet wound he sustained during the riots. When asked whether he would resign from office, Knowles said no. He promised that the city would create a civilian review board over the police department. Some members of the crowd – especially the younger audience members – said they felt marginalized and disrespected by police and community leaders. A few were also upset there wasn’t a panelist to represent younger people. From left: Habitat For Humanity St. Louis CEO Kimberly McKinney, former St. Louis Police Chief Dan Isom and former Sen. Rita Days. “In all necessary means of what I’m saying, we’ve been hurt,” Mitchell said. “And I look past this just beyond a racial issue or police brutality. Because we also need to police ourselves and take responsibility for ourselves. But also in that action with the police brutality going forward, to pay that attention – not just let it be an underlying issue that goes beyond the means of being swept under the carpet again." Sen. Rita Days said Brown’s death should provide more attention to how the region is divided, especially along racial lines. She also said it should provide voice to African Americans who feel disrespected by the police. Near the end of the forum, Isom expressed sorrow that leaders of St. Louis “haven’t done a really good job.” He said Brown’s death should be a time for self-reflection. Just as the Freedom Riders for the 1960s found shelter in a church, so did the modern Freedom Riders who made their way to St. Louis this weekend. Nearly 300 young activist from 20 states gathered at St. John United Church of Christ this weekend to kick off a variety of efforts in St. Louis. The group heard speeches from local people who have been involved in Ferguson, including St. Louis rapper Tef Poe. 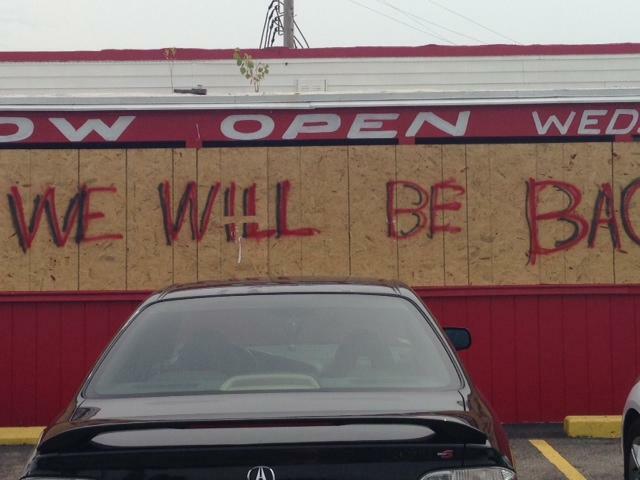 Missouri Governor Jay Nixon announced a $1 million dollar Small Business Relief Program Thursday in the wake of unrest in Ferguson. The program will offer zero-percent interest loans of up to $10,000 for small businesses impacted by the riots. The loans are available to businesses in Dellwood, Jennings and unincorporated St. Louis County as well as Ferguson. On this week's episode of Politically Speaking, St. Louis Public Radio's Chris McDaniel, Jo Mannies and Jason Rosenbaum welcome St. Louis County Councilwoman Hazel Erby to the show. Join us here as we live blog from our event Thursday evening, Ferguson and Beyond: A Community Conversation. The event will be from 6-8 p.m. at Wellspring Church in Ferguson, Mo. NPR's Michel Martin will host and moderate the event. A recording of the evening will be broadcast on Friday, August 29 at noon on our air and will be archived.